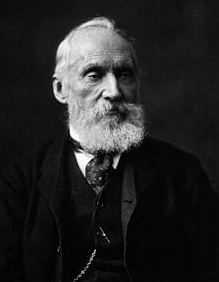 William Thomson, better known as Lord Kelvin, is well known for his achievements in the field of physics, amongst them absolute zero and others in thermodynamics, the Joule-Thomson Effect, the famous Kelvin equation, and for implementing the international measurement standard, the Kelvin scale. The unit Kelvin, along with Celsius and Fahrenheit is the more commonly used units in the measurement of temperature today. Like any other great scientist before and after him, Lord Kelvin connected the dots between science and daily life, and one of the more fascinating examples of this is his missive to The London Times, in which he warned against the possible health risks of shampoo and human hair in the 19th century. Mrs. Anne Samuelson of London, was reported dead after an accident at the hairdresser’s. The shampoo contained a mixture of petroleum, as was common practice in that day, and even in the absence of any other heat source, the shampoo proved lethal: Mrs. Samuelson’s hair took fire. As a warning that may possibly be useful in preventing the recurrence of any such terrible accident as that which recently happened through the ignition of an inflammable hair wash, it ought to be generally known that the faintest electric spark suffices to ignite an inflammable mixture of a combustible gas with air. This is illustrated in elementary lectures on electricity by “Volta’s cannon”, a little varnished brass gun, mounted on a glass pillar and having a wide touch hole plugged with sealing wax, in the center of which is mounted a brass wire, carrying a little brass knob outside and projecting inside to within one-twentieth of an inch of the end of another brass wire fixed to the metal of the gun. The gun is filled with an explosive mixture of oxygen and hydrogen and its muzzle is plugged with a cork. The varnished outside is struck with a piece of catskin and, thus electrified, the gun is left insulated on its glass pillar. To fire it, all that is necessary is to touch the projecting knob with the finger. This causes discharge of the electricity by two exceedingly faint sparks, one barely, if at all, perceptible by the finger before contact with the knob outside, the other in the one-twentieth of an inch air space within the explosive mixture inside. A loud explosion is heard and the cork is projected with sufficient violence to tear a canvas picture if it chances to touch one. In the recent inquest, it was stated that the merit of the hair wash was that it dried so readily. The hairdresser said he felt the hair warm in his hand, and immediately after that all was enveloped in flames. The fact that the hair seemed warm to the hand was due not to the beginning of some kind of spontaneous combustion, as must, I believe, have been imagined by many readers of the report. It showed merely that the part of the hair touched had quickly become dry. Very slight friction of the hand on the dry hair would suffice to produce an electric spark, and the explosive atmosphere of air, mixed with combustible vapor from the portions of the hair not yet dry, was there. The conclusion of the inquest shows that no gas was burning in the neighborhood, and that no lucifer matches were lying about on the floor which could have been ignited by being trodden on. A gas flame within a yard or two of the place would certainly have been dangerous, but far less apt to produce the disaster than an electric spark from the hair in the very place of greatest liability to the presence of an explosive mixture. The accident invoked widespread shock throughout London. Thankfully, shampoos are much safer.